When the oil industry tycoon Warren Buffett poured $26 million into TIDES foundation, he was making a strategic long-term investment in hijacking the environmental movement. Like the Rockefeller Brothers and Buffett’s close friend Bill Gates, they know how important it is public relations (PR) wise to appear as benefactors of humanity, while scheming to cash in on the gullibility of young, impressionable activists. Financially compromised non-governmental organizations (NGOs), i.e. World Wildlife Fund, The Nature Conservancy, and 350, promise the largest return on investment Wall Street has ever seen. While some international NGOs still take money directly from corporations, it is more effective to launder money through foundations, i.e. NoVo, TIDES, Gates, Ford and Rockefeller. This investment induces self-censorship and fraud by NGOs that appear genuine to the public, while kowtowing to their Wall Street funders’ agenda. In terms of climate change activism, the funding by foundations like NoVo (Warren Buffett), TIDES (an oil industry money laundry) and the Rockefeller Brothers enables cons like the college campus fossil fuel divestment scam, in which 350 and friends function as ‘grassroots’ front groups. 350 began its dark career betraying the G77 at COP15 in 2009, and continued its shady dealings by sabotaging the 2010 Indigenous peoples’ climate conference in Bolivia, then proceeded to choreograph the KXL PR campaign, with funding from oil train magnate Warren Buffett, laundered through NoVo and TIDES. More recently, 350 has come out with new propaganda to mislead climate activists. As they did with the KXL charade and the fossil fuel divestment hoax, 350 will no doubt promote ineffective disobedience as a means of diverting activist energy from reality-based social change that might threaten the 350 funders’ fossil fuel investments. As a fossil fuel industry-financed organization, 350 is the most insidious Wall Street Trojan Horse since Avaaz and Purpose. The 350 followers, like most activists, are utterly clueless. When 350 targeted Bolivia and The Peoples Agreement on Climate Change for subversion in 2010, it was an act of aggression with roots in the 2009 attempted coup — funded by the U.S. State Department — in reaction to the 2008 constitutional revolution of Bolivia’s Indigenous peoples. The inspiration for the Indigenous uprising, that saw the world’s first Indigenous head of state elected, was the 2005 attempt at privatization of Bolivia’s water by the US-based Bechtel Corporation that foreshadowed the “new economy” promoted by 350 in 2014. That “new economy” builds on other privatization schemes on a global scale; REDD and other carbon-market shell games, like fossil fuel divestment, are the ultimate institutionalization of the theft of public resources by the finance sector. The finance sector – that in 2008-2009 devastated the US and EU economies through loan fraud and bank bailouts – has now set its sights on privatizing all aspects of life on earth. Cheerleading global privatization — enabled by UN agencies like the IMF and World Bank — are financier-sponsored NGOs like 350, Avaaz and Ceres–all of which have fundamental ties to Wall Street moguls and finance sector criminals. Having hijacked the environmental movement on behalf of Wall Street, these false fronts are currently pressing for changes in international law that would give the finance sector carte blanche in privatizing all of nature. 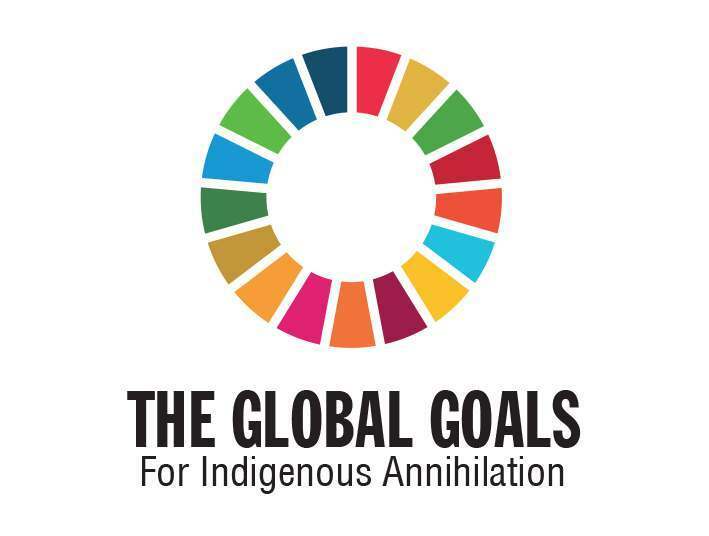 With the 2007 UN Declaration on the Rights of Indigenous Peoples – a threat to globalization – the finance sector immediately began co-opting the Indigenous peoples movement through foundation grants to compromised NGOs approved by the UN. These compromised NGOs and individuals are paid to legitimize the annihilation of Indigenous nations via UN agencies in partnership with Wall Street. As Indigenous nations challenge Wall Street and the UN over globalization, compromised NGOs like 350 distort reality through social and mainstream media. The “new economy” they promote is essentially what used to be called fascism. While finance sector puppets like Naomi Klein charm gullible liberals with bromides and syllogisms about sustainability, what they are in reality sustaining is totalitarian corporate control of world governance and human survival. The tribes that kept KXL out of their territories are understandably pleased by the momentary suspension of that pipeline project. Their illusory ‘victory’, however, requires that we temper the euphoria around the KXL rejection with a dose of reality. To not do so only sets up the naive to be hoodwinked again. Delaying KXL does not halt the annihilation of the Athabaskan peoples, whose territory is a carcinogenic wasteland. It merely means the Tar Sands toxic bitumen will make its way to the Gulf of Mexico by other routes, which incidentally are already operating, making KXL redundant for now–the real reason for the celebrated KXL ‘rejection’. The suspension of KXL coincides with a glut of oil reaching the Gulf, necessitating development of greater storage and terminal capacity there. That, and plans to develop pipeline and oil train terminal infrastructure on the West Coast of Canada and the Northwest US, is why KXL rejection no longer matters to oil exporters, but made Warren Buffett, Bill Gates, and their Tar Sands pals a bundle. The reason for the glut goes back to 2012, when Obama opened up millions of acres for gas and oil in 23 states, ushering in the fracking boom that brought us chemical injection aquifer contamination, and ‘bomb trains’ owned by Obama’s friend Warren Buffett since 2009, when he purchased Burlington Northern Santa Fe Railroad (BNSF) for $34 billion–the same year Tides Foundation funded 350. 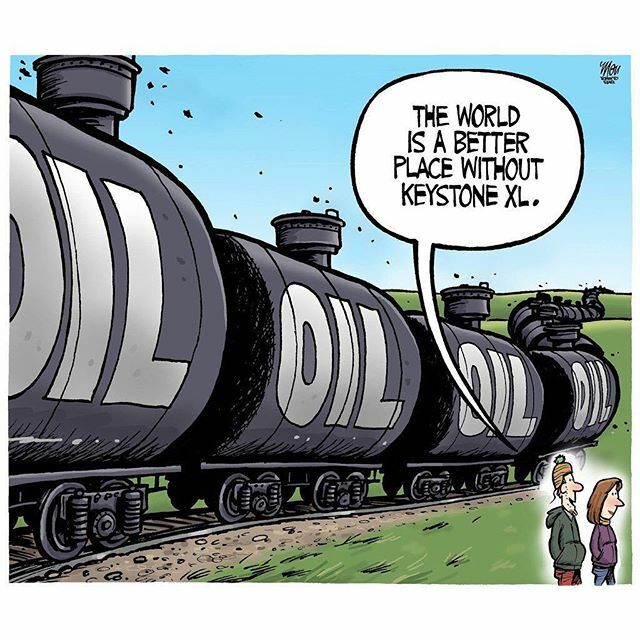 In 2010, 350 launched the campaign to reject KXL; by 2014, crude-via-rail in the US soared to 500 thousand car loads per year, up from 5 thousand in 2008, with trains exploding across Canada and the US. As noted in Railroading Racism, BNSF is embroiled in conflict with the Affiliated Tribes of Northwest Indians that opposes Buffett’s bomb trains and associated oil train terminals in Washington State. BNSF has responded by helping fund Tea Party-led political action committees (PACs) deeply involved in promoting anti-Indian white supremacy. To refresh readers’ memories, the KXL ‘grassroots’ hoax was funded in large part by Tides (flush with Buffett money) with 350 at the helm. Funds laundered through Buffett’s foundation NOVO and the Tides Foundation — a money laundry used by Tar Sands investors and other elites to control NGOs — helped finance the KXL NGO charade, thus eclipsing any discussion about shutting down the Tar Sands, and making possible the explosive growth of bomb trains and other pipelines. As noted at Wrong Kind of Green, There Was Nothing Key About Keystone XL — Except Diverting Our Attention For More Dirty Profit. As noted at The Real News Network (TRNN), regardless of Keystone XL, Tar Sands Oil Will Still Flow to the Gulf. Interestingly, the TRNN cover-up of the Klein/Buffett charade remains for the most part unexposed by all media other than CounterPunch. As I observed in April, Distorting Reality is what liberal gatekeepers like TRNN do. That’s why two-thirds of its ongoing operating revenue comes from the rich, i.e. Ford Foundation. Ford, Rockefeller, and Buffett essentially own the entire ‘grassroots’ KXL NGO milieu. Hypnotic induction — getting a person into a trance or state of increased suggestibility — during which critical faculties are reduced and subjects are more prone to accept suggestions, might help to describe the current fascination with Naomi Klein. While the popularly-expected cultural rituals of celebrity worship in America are familiar to anyone who watches television or reads People Magazine, its application to social media has become a powerful new tool of social engineering by Wall Street. The process of influencing a mass audience to respond reflexively to induced prompts — like marching in parades or flooding financial districts wearing the color blue — requires looking beyond the civil society fad of I-pad revolution, and examining modern social “movements” as cults. Icons like Klein are as interchangeable as Hollywood starlets, but mass hypnosis of social activists by Wall Street titans using foundation-funded NGOs is a troubling development. When Klein and McKibben herded thousands of college students across America to fight climate change by forcing their schools to divest in fossil fuels, no one stopped to ask if that would make any difference. Using the emotive force of the idea of divestment as people power — based on an intentional association with its use in South Africa and Palestine — 350 inducted hypnotic behavior that omitted any critical judgment. The fact that apartheid was opposed by a combination of boycott, divestment and sanction by national and international institutions in support of armed insurrection was lost on the climateers. Instead, they were hypnotized into believing that colleges selling back fossil fuel shares to Wall Street (where unscrupulous investors could then make a killing) was part of a magical social revolution. The same could apply to the nonsensical demand to end fossil fuels. The mystery of the KXL distraction, revealed by Cory Morningstar to be a choreographed hoax funded by Warren Buffett, is yet another example of hypnotic behavior absent critical judgment. As noted by Morningstar, the KXL protests and hoopla promoted by 350 made it possible for Buffett to develop an oil-by-rail empire, now threatening communities across North America with bomb trains, like the one that devastated the town of Lac Megantic, Quebec in 2013. As a diversion calculated to lessen effective opposition to fossil fuel export and over-consumption, seductive energy tales and celebrity-laden photo-ops in front of the White House substituted for popular education and political organizing. By the time Klein’s followers figure out they were duped into being Buffett’s pawns, he and his friend Bill Gates will have made a fortune shipping Tar Sands bitumen and Bakken Shale crude. For the present, the climateers have taken up poster-coloring and holding hands. Klein’s aura, meanwhile, has taken on a life of its own. Having memorized her mantra This Changes Everything, climateers and other devotees are now all abuzz over her mesmerizing campaign against capitalism. No one asks how that meshes with Klein’s 350 being the darling of Warren Buffett and the Rockefeller Brothers, but suspension of disbelief is nothing new to Klein groupies. As gullible left-wing media begins yet another social media gossip fest over how far left the new incarnation of rhetorical revolutionary fervor might go, 350’s Blue Team and other Klein followers double down on dubious diversions. As Klein and her colleagues work feverishly in creating cover narratives that lefties can flog as insightful op-eds to coincide with the never-ending anti-capitalist revolutionary historic Rockefeller-financed 350 events, it is hard to avoid comparisons with George Orwell’s Ministry of Truth in his novel, 1984. 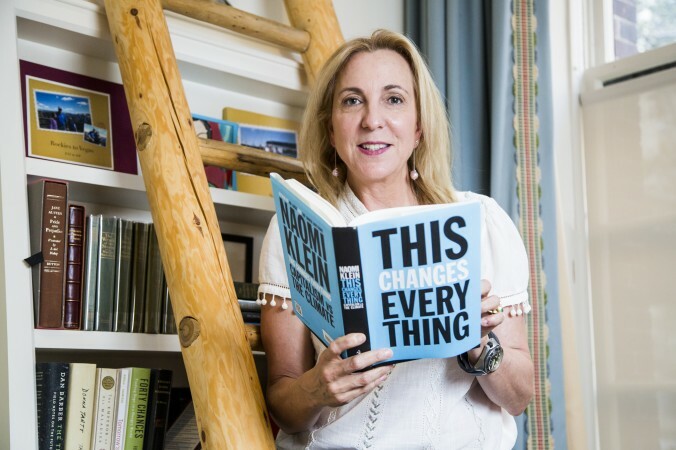 After the groupie chatter and celebrity banalities of climate week subsided, trite starlets like Klein carried on with their Wall Street-backed charades. The question is whether their adherents will reject the fantasy world of vapid luminaries become famous by stating blatantly obvious platitudes, or continue to be wowed by their cult-like mastery. For now, the hoax endures. “Clean” energy. Above: The Tampakan mining project for copper and gold (Mindanao island, southern Philippines). 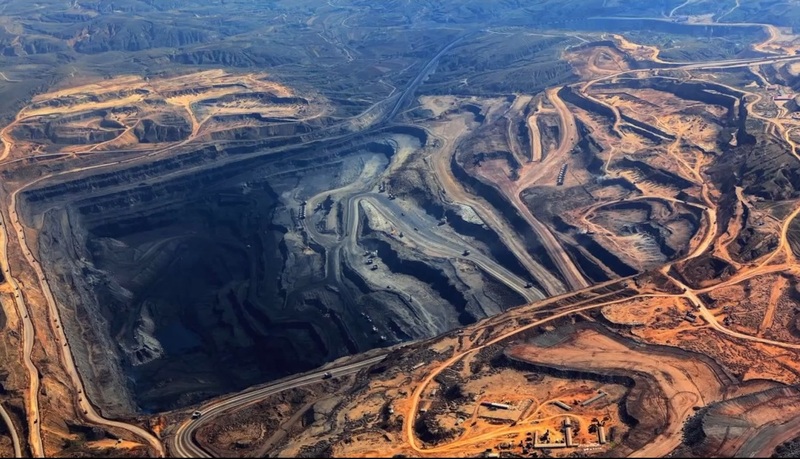 The push for solar and wind will ensure global copper markets (and many other mining projects of rare Earth minerals) will continue to expand – along with the further plundering of the planet. This mining project threatens to displace thousands of people and destroy 10,000 hectares which are home to rainforest and the source of five rivers. Security forces have committed atrocities against local B’laan indigenous communities which oppose the project. BDS against Israel, and formerly against South Africa, used the three-part formula of Boycott Divestment Sanction. Divestment, as used by 350, omits boycott and sanction, and limits divestment to meaningless, symbolic acts. When it comes to the 350 agenda, they leave out the boycott of fossil fuels, and the sanction of fossil fuel corporations, and instead press for divestment by institutions like colleges and universities. All this divestment does is make once publicly-held shares available on Wall Street, which allows trading houses like Goldman Sachs to further consolidate their control of the industry. BDS, when applied against apartheid states by other states and international institutions, includes cutting off access to finance, as well as penalties for crimes against humanity. What makes 350 so devious, is that they hijack public emotions (and ignorance) using phony “divestment” as a disorganizing tool to redirect activism away from effective work. The inheritors of the Standard Oil fortune (Rockefeller Brothers) would not be funding 350 were they not thus disempowering their naive followers. Enchanting as the chimera of clean energy might be, it doesn’t scale to meet energy demand, and its use by marketing agencies like Avaaz, Purpose and 350 is to perpetuate the misbelief that Wall Street — which caused all our social and environmental problems — is our only hope for salvation. Sort of a New Age Ghost Dance. 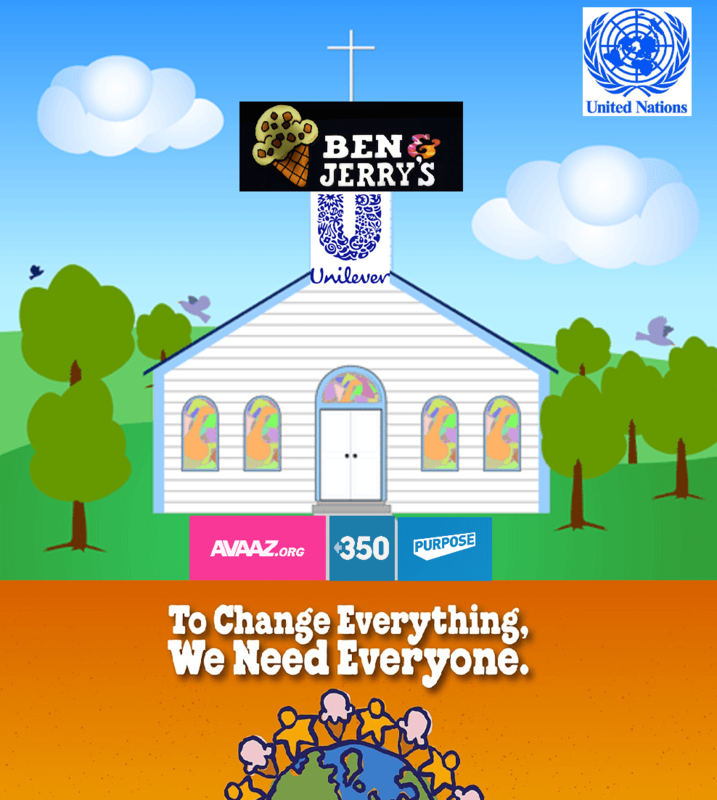 The cult of consumerism, through which 350, Avaaz and Purpose adherents identify with their brand, is similar to religion, in that becoming a follower is an act of faith. By unquestioningly accepting the propaganda as truth, they form beliefs that comprise the doctrine supporting this ideology of false hope. It is not unlike hierarchical religion, in that it is patronizing of the believers, who desire to remain infantile in their psychological and financial dependencies. Political illiteracy reinforces this relationship. It is, to say the least, unhealthy. Social engineering in the digital age is amazingly simple for those who have the money and media at their disposal. Wall Street’s Mad Men can easily herd millions of progressives via social media to support catastrophic environmental policy, war, and crimes against humanity. Sold as conservation, “humanitarian intervention”, or development, globalization can then be marketed as a progressive choice, albeit leading to totalitarian corporate control of all life. Slogans like “350”, “New Economy”, and “Sustainable Capitalism” are promoted by Mad Men via foundation-funded front groups, and echoed by media, thus generating enough noise to overwhelm critical judgement. Symbols that appeal to progressives’ emotional vulnerabilities, like rising sun logos used to symbolize hope and change, are recycled to mean “This Changes Everything”, thus creating the impression that neoliberal reform is socialist revolution. World Business Council for Sustainable Development is part of a Wall Street strategy to dislodge the United Nations Center on Transnational Corporations, and prevent enforceable rules governing the operations of multinational corporations. A partner of WBCSD is Ceres (Coalition for Environmentally Responsible Economies), whose funders are associated with Goldman Sachs, JP Morgan Chase, Citigroup, Morgan Stanley and Bank of America. 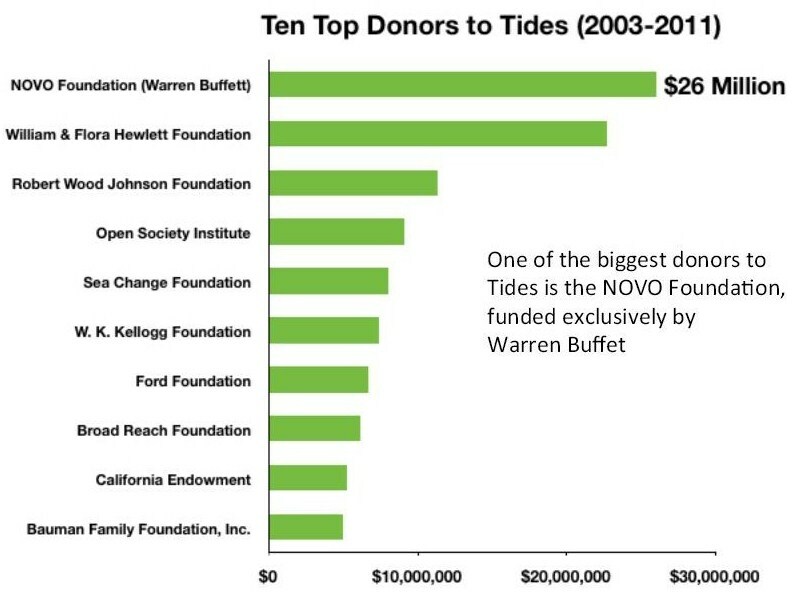 Ceres and 350 are funded in part by TIDES, whose largest donor is NoVo–Warren Buffet’s private foundation. Recently, WBCSD launched another initiative to privatize ecosystems — Natural Infrastructure for Business — and to capitalize on the Breakthrough Energy Coalition boondoggle hyped by the financial elite at COP21. The privatization of public process and policy — which led to economic collapse in the US, and bank bailouts from the U.S. Treasury that eviscerated the general welfare — is now being enacted at the UN. The Clean Energy Ponzi Scheme and the ‘new economy‘ — false hope marketed for the financial elite by Havas, Avaaz and 350 — now has its sights set on privatizing the planet. As a Wall Street shell game, the global fossil fuel divestment campaign — exposed by Cory Morningstar in Divestment as the Vehicle to Interlocking Globalized Capital — is a PR masterpiece. Were divestment ever to succeed in lowering the valuations of fossil fuel companies, an unintended consequence could be a shift from public markets to private markets… Such a shift could hurt transparency; companies that go private have minimal reporting obligations and they typically become very opaque. This could limit everyone’s ability to engage the management of these companies in a discussion around climate change. Discursive monoculture is the result of investment in private equity media, university endowments, and NGOs. The energy industry understands production and consumption cycles, and makes just as much on low prices as high. When the glut from fracking is burned up by frolicking consumers, they’ll double the price again, and make a killing on the divested shares. Using hedge funds and other non-transparent private equity trading firms, the aristocracy – that is heavily invested in fossil fuels – is betting on increasing oil and gas consumption, long into the future. Corporate media rarely discusses the American aristocracy and how their agenda affects society. Consumers blame banks, but they have no idea how financial institutions are used by private equity traders to constantly replenish aristocratic wealth at our expense. 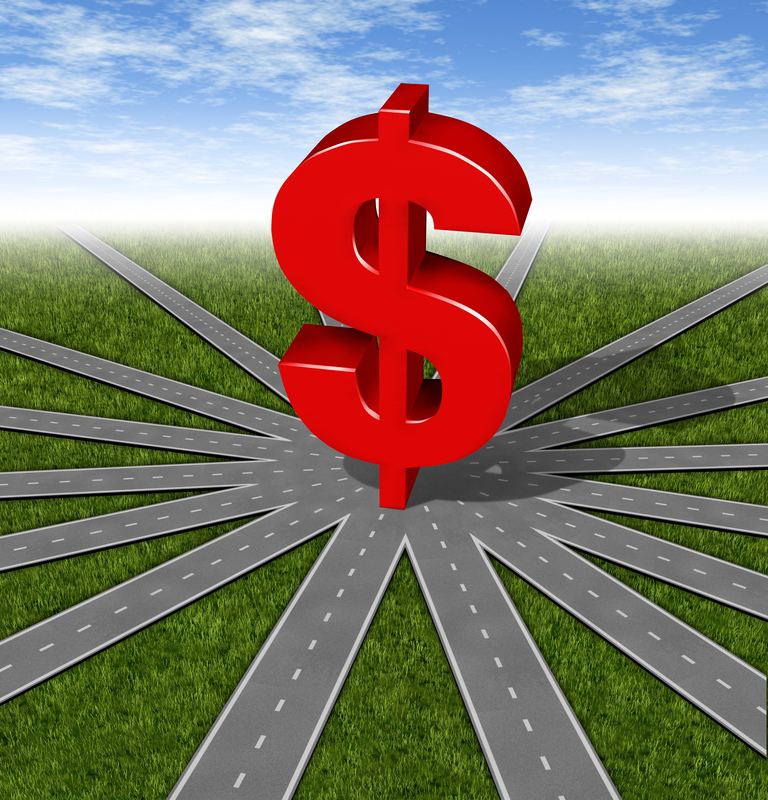 Private equity funds are not openly traded in any public stock exchange system, and therefore face considerably less regulatory oversight from institutions such as the Securities and Exchange Commission than their publicly traded counterparts. Buying energy assets on the cheap as a result of fossil fuel divestment by universities and pension funds, investors such as Goldman Sachs Capital Partners “wield an immense amount of political influence” that divestment on college campuses helps to increase. While students celebrated divestment at their schools, private equity in 2015 raised $34 billion for oil and gas funds—a 94% rise from 2012.